This journal entry will be a kind of personal voyage back in time for me. 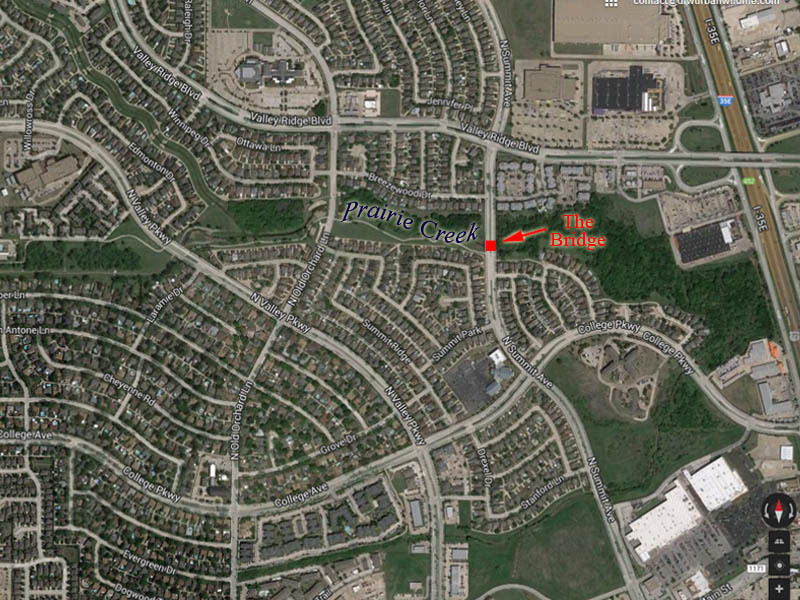 I’ll be going back to the late 1970s and early 1980s to a place called Prairie Creek. 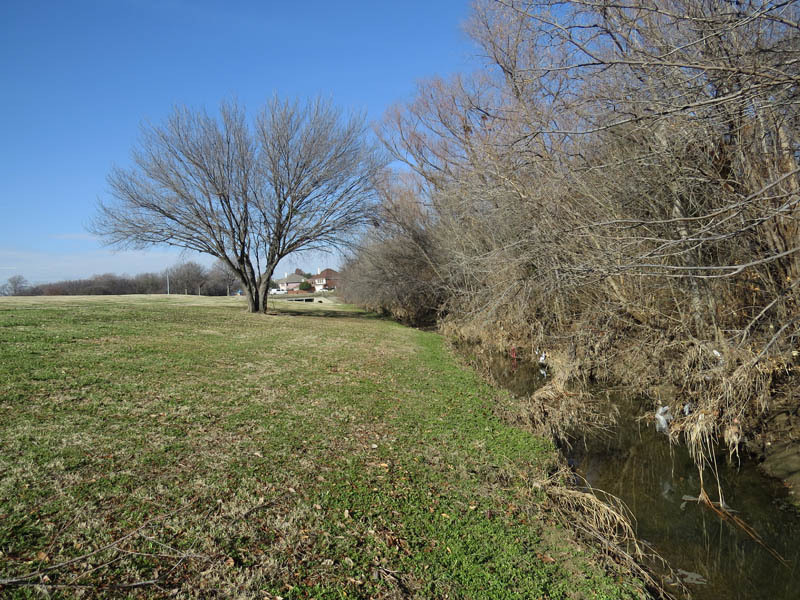 Located in Lewisville, Texas, Prairie Creek is where I first began spending time outdoors as a young man. It is where I discovered my interest in native wildlife. There was a time, for a few brief years in my youth, that this was my favorite place on earth. Below is an aerial photograph of what that area looked like around 1979 or so. I’ve annotated it with some important landmarks. Most of my activities centered around the place labeled “The Bridge”. In fact, back then that is how we referred to the whole area. When the phone call from my friends came in after school the question would be, “Hey, do you want to go down to The Bridge?” The reply, by the way, would always be affirmative. 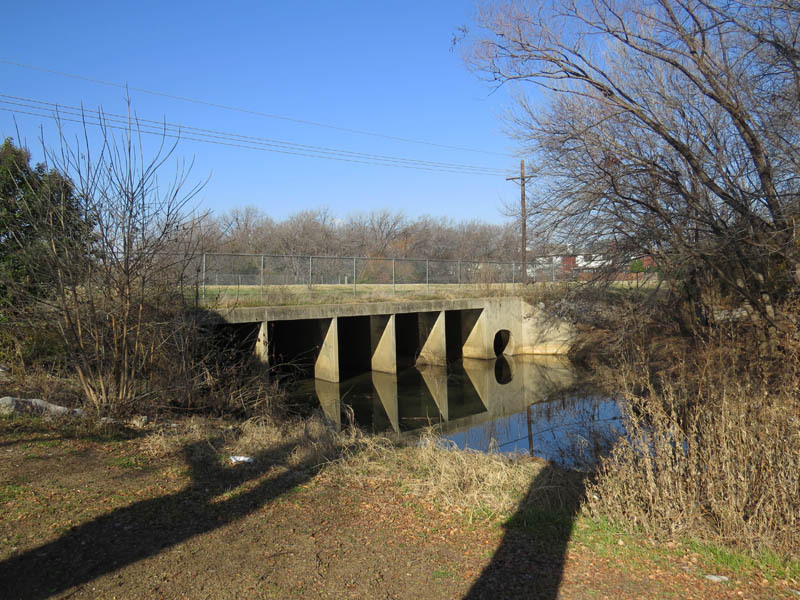 The bridge over Prairie Creek consisted of two concrete abutments with a series of big steel i-beams stretched between them. On top of the i-beams were large flat treated timbers and on top of the timbers was a layer of asphalt and dirt. No guard rails and no reflectors. It was a very primitive structure as far as bridges go. 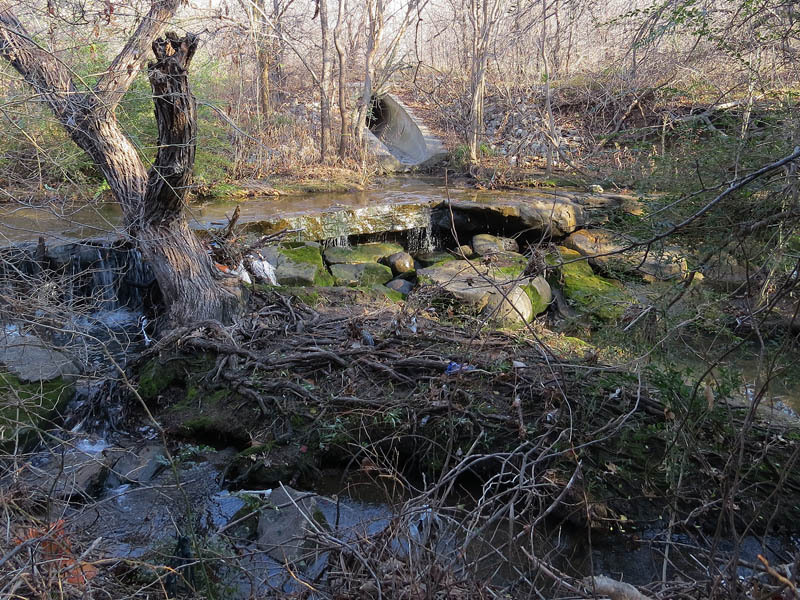 Accessible by unnamed dirt roads only, this property was rarely visited in those days. The land east of The Bridge hosted a herd of near wild cattle. 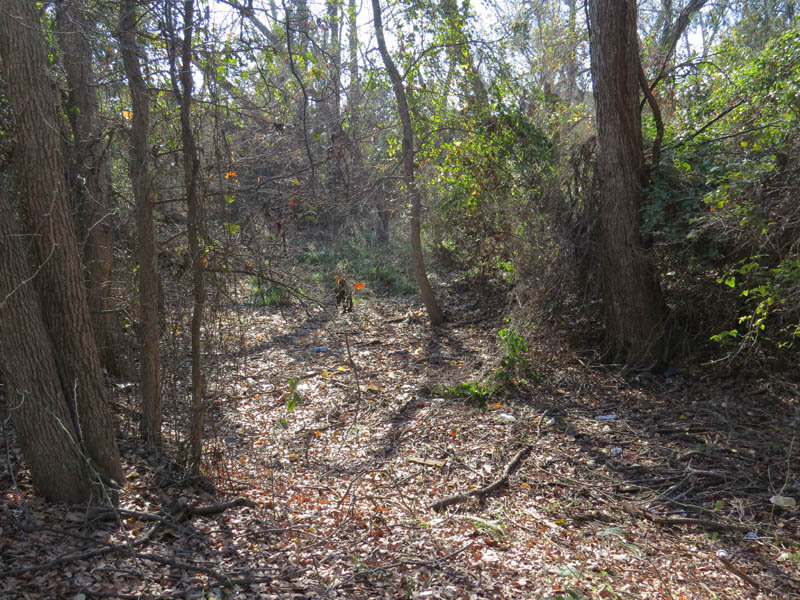 A system of motocross trails were etched across the western part of the property, and an illegal trash dump was located roughly in between. The owner of the property was surely exposed to great potential liability over the years. I found the whole situation endlessly fascinating. 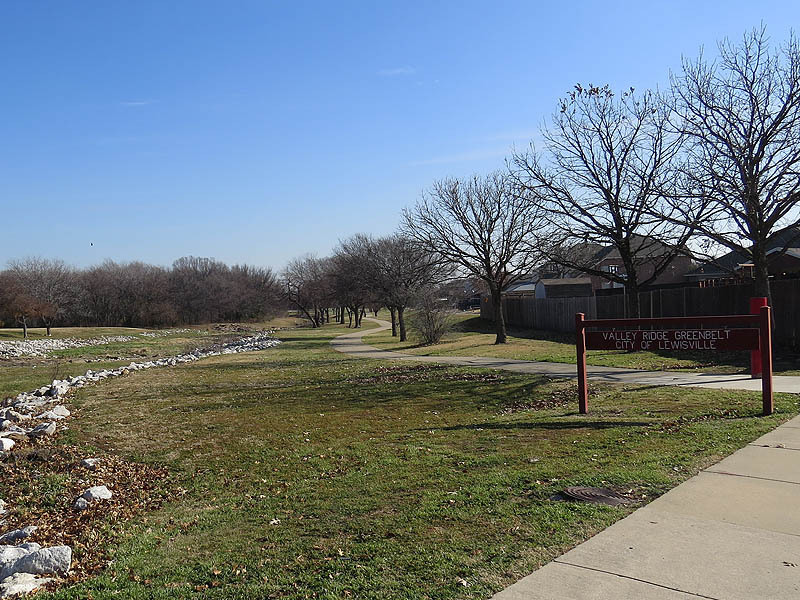 The wilderness, the bike trails, the surly wild cows, and even the trash heaps added interest to the place. One man’s trash is another’s treasure. There was always something new to discover. Looking at that old aerial view reveals just how sparse of a wilderness this place was. At the time it seemed endless and expansive to me—something that would rival Yellowstone. The world shrinks as you grow older. 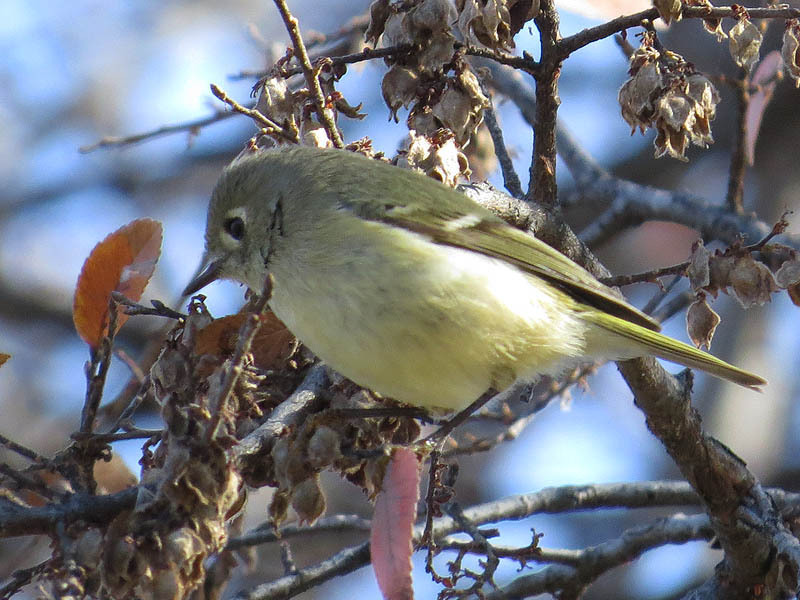 I returned to Prairie Creek for the first time in 30 years on a warm sunny December morning. 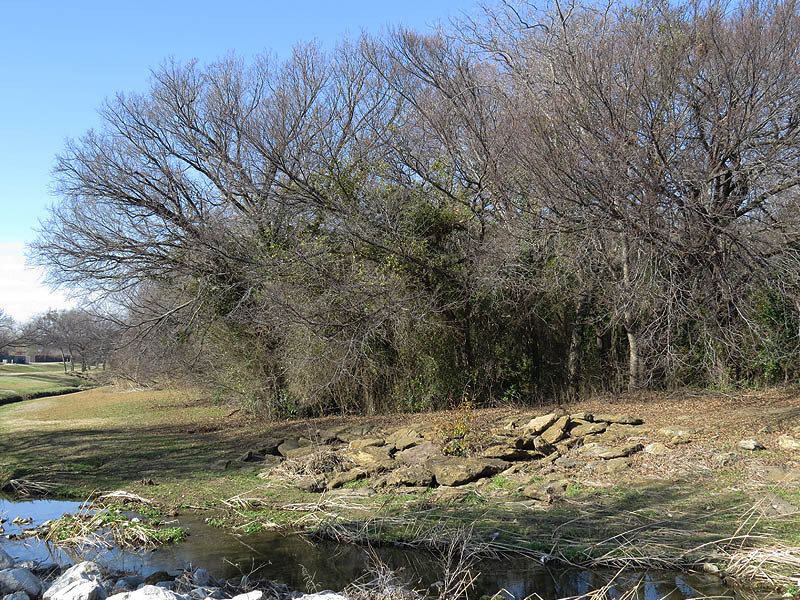 I began my visit by accessing the creek via a trailhead near College Parkway and Interstate I-35. Here I found familiar outcroppings of exposed sandstone. I remember this place specifically from my youth. My friends and I sometimes speculated that the some of the regularly spaced depressions on the stone’s surface might be dinosaur tracks. 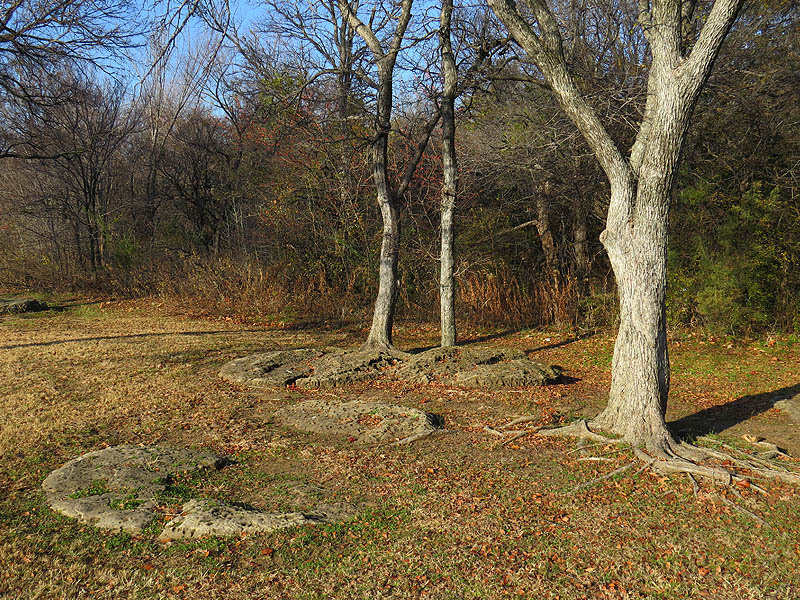 I have no idea whether that was really what we were seeing, but the actual occurrence of fossilized tracks in North Texas is not unheard of. 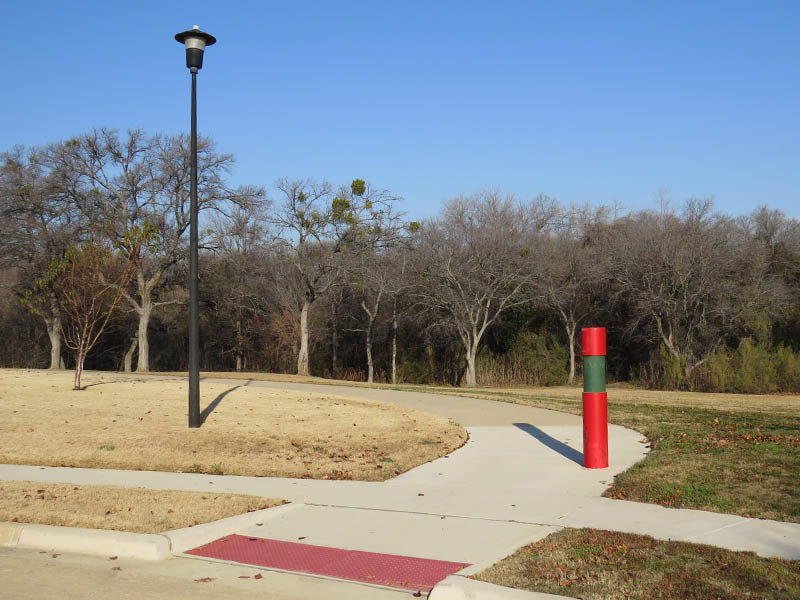 The trailhead at Valley Ridge Greenbelt Park. What remains of the old sandstone flats. 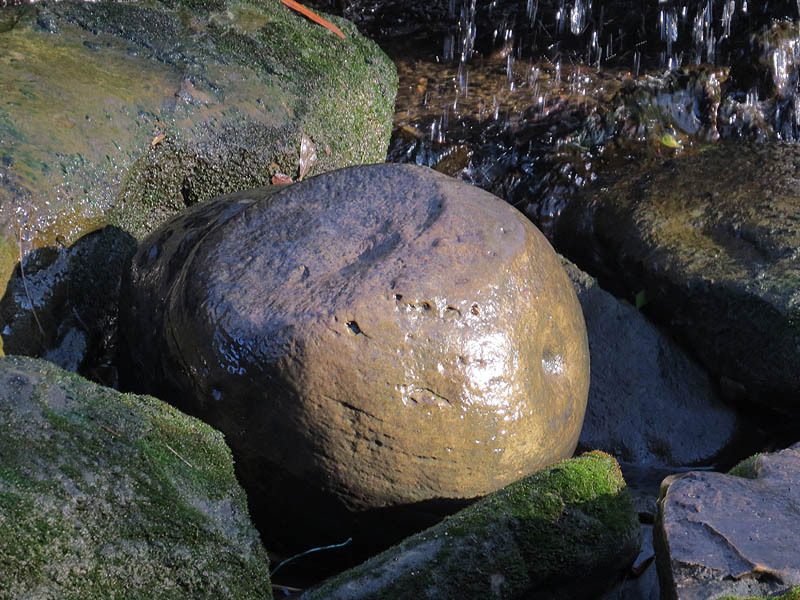 A concretion is a hard, compact mass of sedimentary rock formed by the precipitation of mineral cement within the spaces between the sediment grains. Concretions are often ovoid or spherical in shape, although irregular shapes also occur. The word ‘concretion’ is derived from the Latin con meaning ‘together’ and crescere meaning ‘to grow’. Concretions form within layers of sedimentary strata that have already been deposited. They usually form early in the burial history of the sediment, before the rest of the sediment is hardened into rock. This concretionary cement often makes the concretion harder and more resistant to weathering than the host stratum. 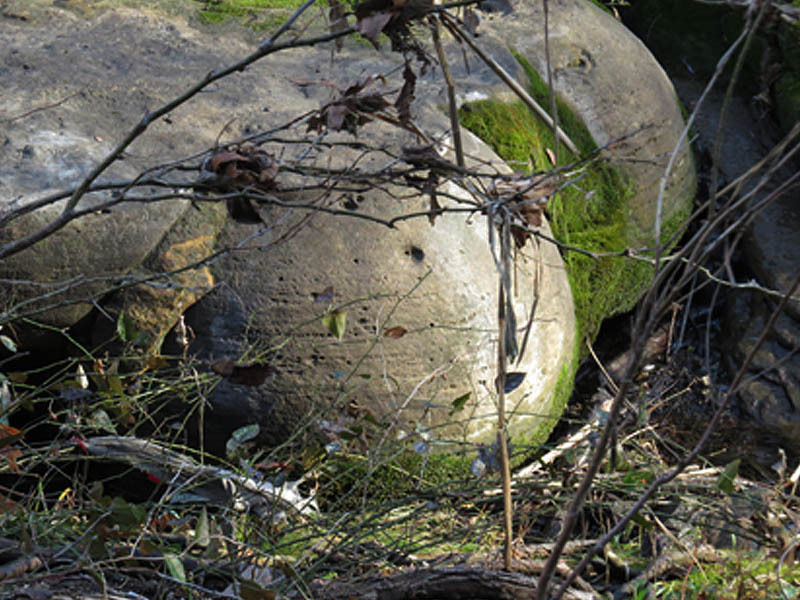 A bowling ball sized concretion. A pair of concretions in the process of being exposed. These two spheres were nearly 2 feet in diameter. The fast moving waters responsible for the erosion. Looking back the other direction I found that Prairie Creek flowed over the sandstone shelf for a dozen or more yards. The water was shallow here making it a perfect place to cross into the more heavily wooded area on the opposite side. Shallow water over a sandstone shelf. The forest on the other side was thick but passable, and I was able to make good progress. 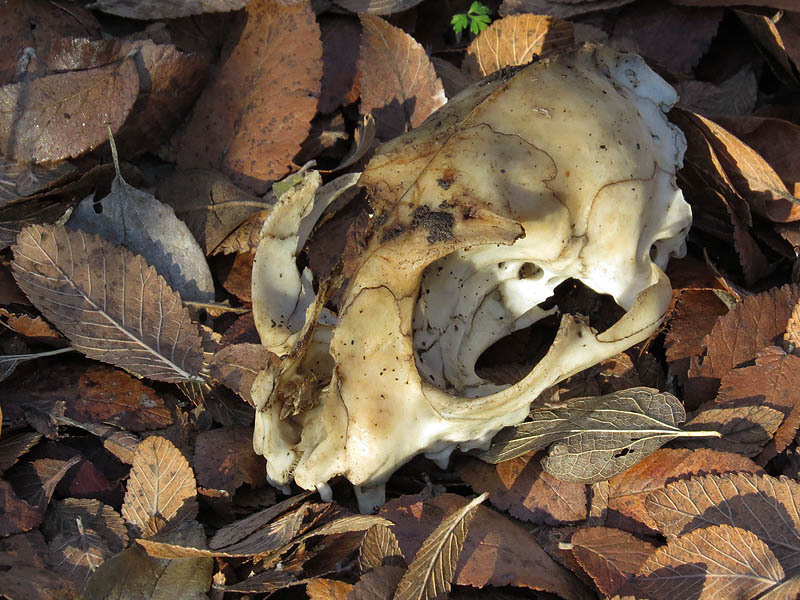 It wasn’t long before I came across the remains of a typical house cat. This unfortunate feline had run afoul of something in these woods and did not survive the encounter. 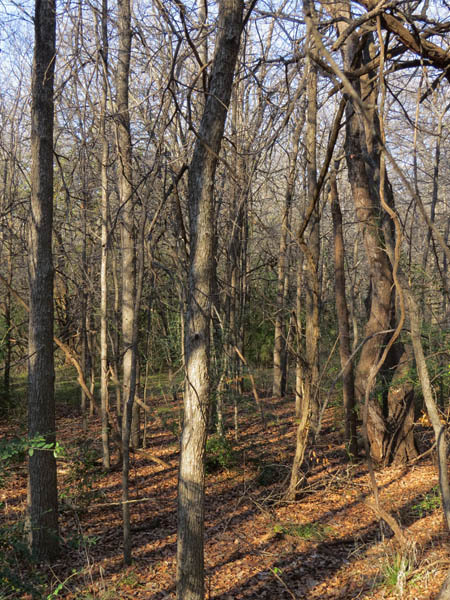 Dense woods near Prairie Creek. 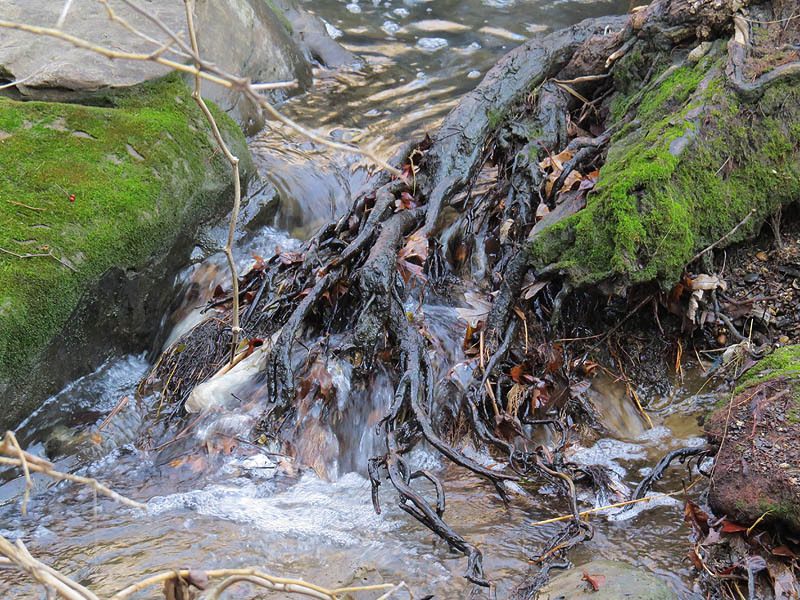 Soon the twisting creek and I crossed paths again. At this spot I found a tree house constructed in a secluded bend. This kind of construction is an age old pursuit of kids who enjoy spending time outdoors, and it is not the first I have discovered in these woods. 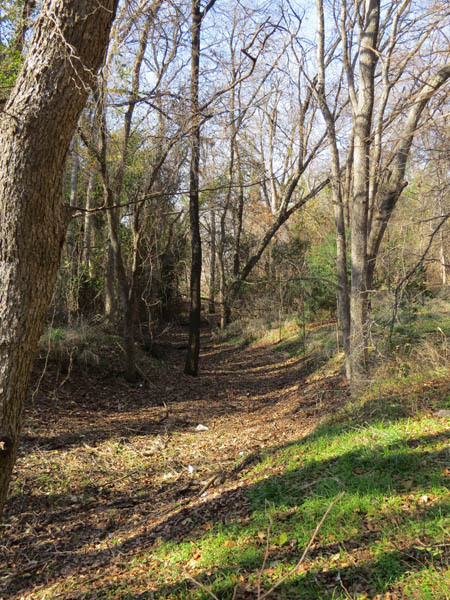 Once in my youth I got it in my head that I was going to climb the tallest tree along this section of Prairie Creek. I could see this tree from as far away as my house and it was a siren song for me. But it wasn’t easy to get to. This particular tree was tucked into a bend in the creek, and was well isolated by a ring of near impenetrable Greenbriar vines. It would require a real effort just to reach it. One day, when I could resist no longer, I made my way to the tree. When I arrived, I discovered that I was not the first to have had this idea. Someone else had already installed a makeshift tree house here years ago and there were still a few, mostly rotted boards, nailed to the trunk to serve as a decrepit ladder. Perhaps not using the best judgement, I started my ascent by climbing these rickety rungs. The suspect boards supported my preteen weight long enough to put me within reach of the first major branching of the trunk. 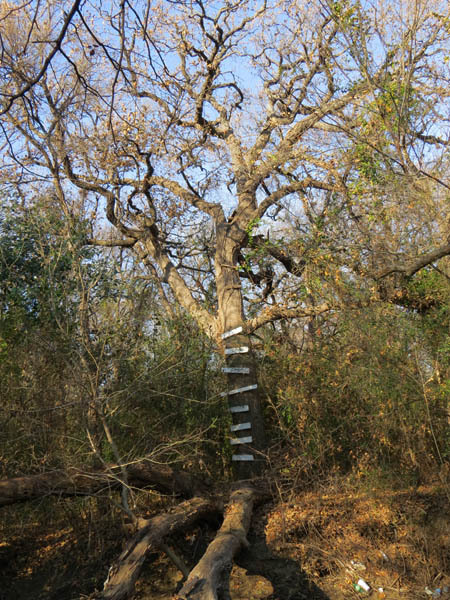 Here, I would have to rely on the structure of the tree itself to climb any higher. I blindly reached up for the crotch of the tree hoping to find a good handhold. As my hand came down on what I expected to be hard tree trunk, I instead felt soft fur and agitated movement. There were two screams at that moment. One was from the Raccoon or Opossum I had roused from its slumber, and the other came from me. 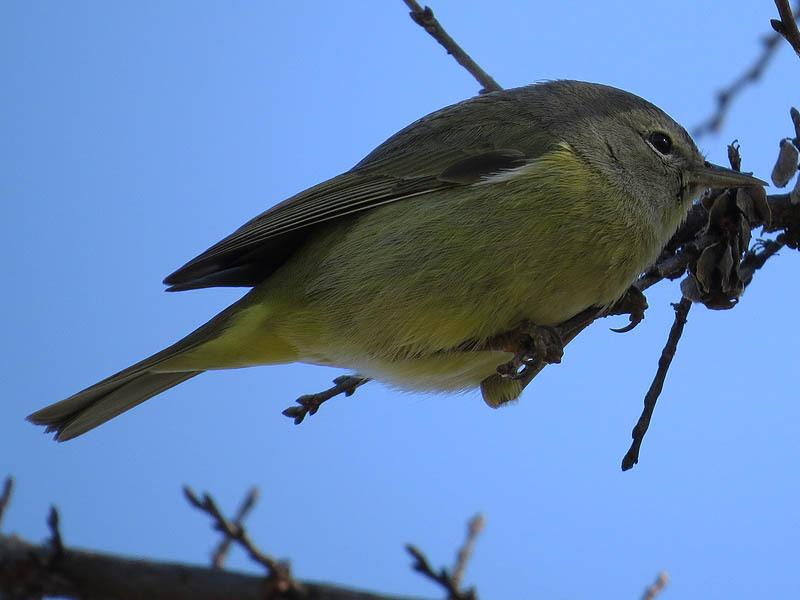 I can remember watching the startled critter sail through the air as it dove headlong in its flight from the tree. At the time I was falling backward and headed for the ground myself. I landed flat on my back and had the wind knocked out of me. 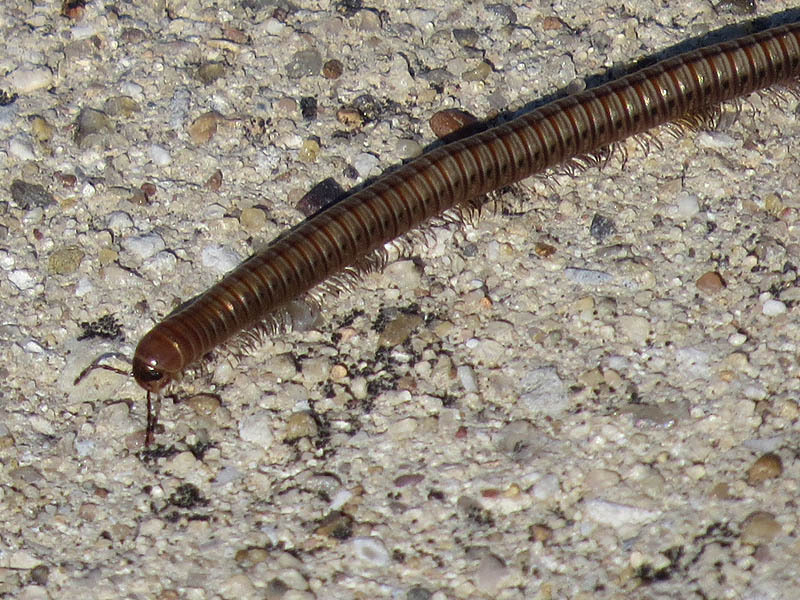 The critter landed on his feet, and made a no nonsense escape down the creek bed. I laid on the ground for a few long minutes trying to get my breath back. I never did get a good enough look at the animal to know for sure what it was—and I never did try to climb that tree again either! 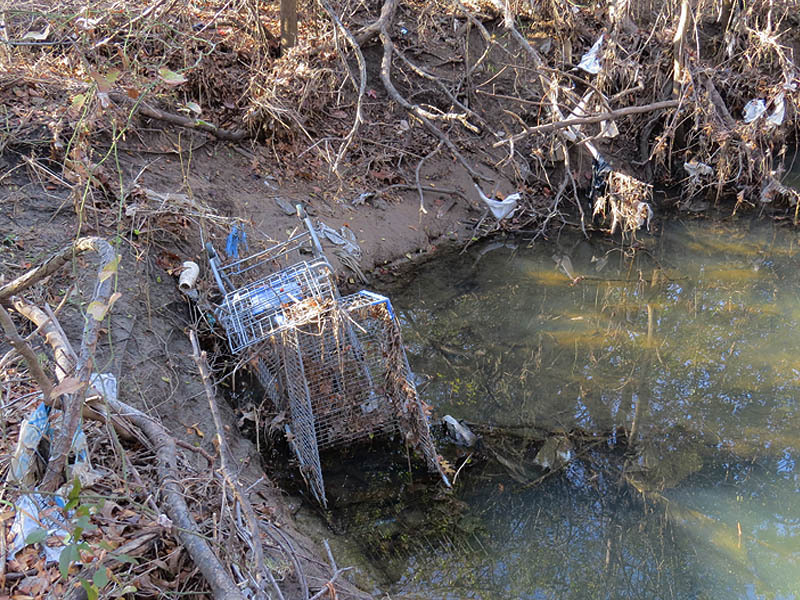 Moving on again, I found the creek increasingly littered with trash from nearby residential neighborhoods and retail establishments. In some places along this route the vegetation became so thick that I did not believe I would be able to continue on. But I always found a way through and eventually reached the remnants of a soft surface trail system. These trails were likely constructed years ago, and appear to be seldom used these days, but they did make passage through this part of the woods much easier for me. 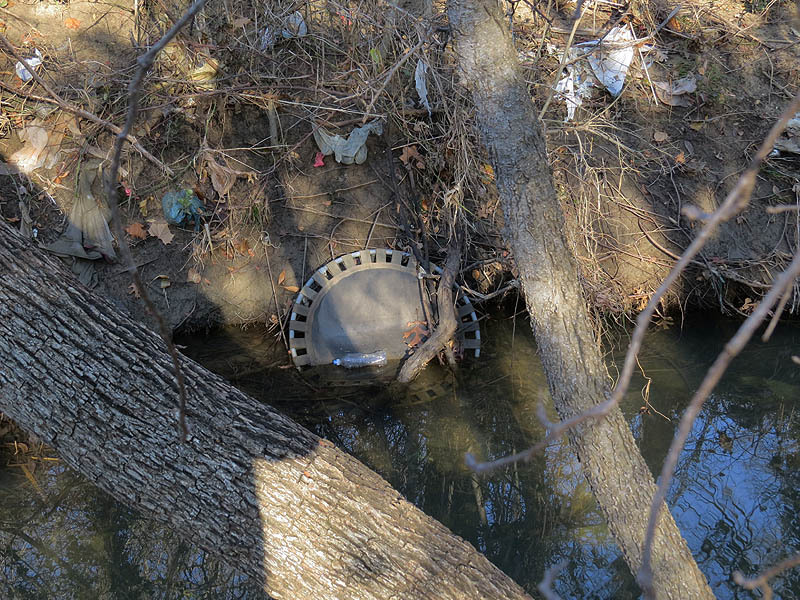 Prairie Creek became more litter with trash along this stretch. Shopping carts from a nearby Lowes. How do you get through this!?! Soft surface trails near Prairie Creek. 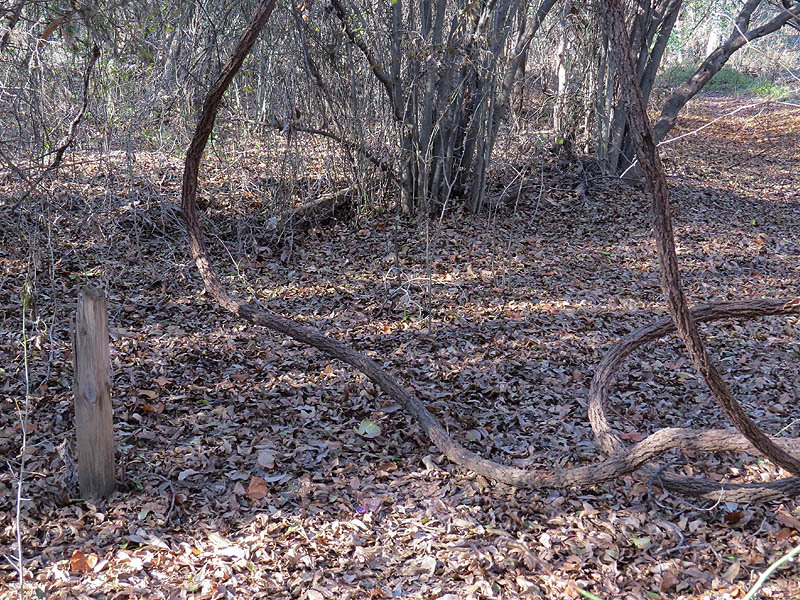 Large vines dangling down onto the trail. Emerging out the other side, I finally arrived at the place where the old bridge had stood. 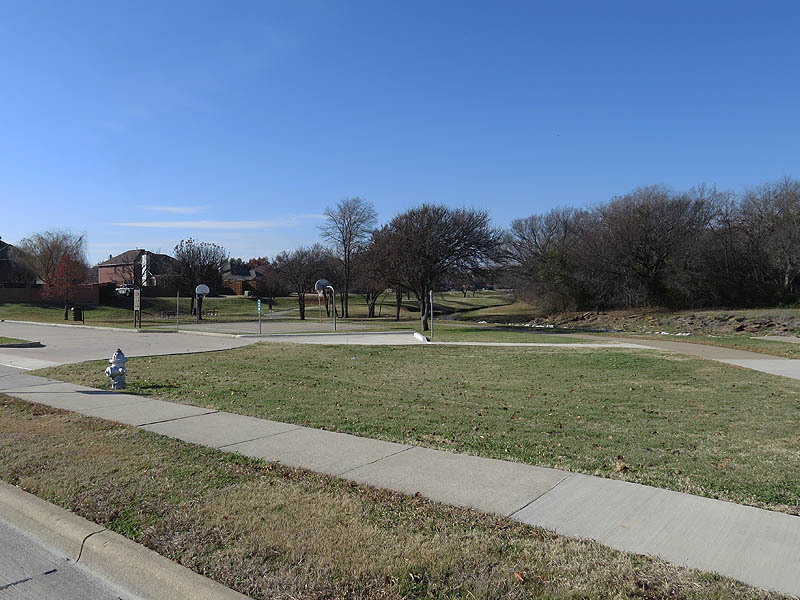 Today there is a nice modern four-lane concrete bridge at this spot with residential neighborhoods all around. But back in the early 1980s there was just the small dirt road bridge nestled in the woods around Prairie Creek. The new bridge is located in almost the exact same spot as the old bridge. I still remember the day we followed the trails and dirt roads down to The Bridge for the first time. We stood looking into the woods still too apprehensive and uncertain to attempt to enter. Suddenly a repetitive knocking noise came to our ears from deep behind the curtain of trees and other vegetation. It was not a natural sound and we found it unnerving enough to encourage us to head for the exit. This is very close to the spot where we stood listening to the strange knocking noise emanating from the woods. Over the next day or so my friend and I puzzled over the strange occurrence until we just couldn’t stand it any longer—we had to get back out there and find out what was making that odd sound. That afternoon we met at The Bridge and searched for a way into the woods. It didn’t take long for us to find a barely-there trail leading into the trees. We followed this path into a large clearing next to the creek and discovered a ramshackle set of constructs made of discarded lumber surrounding a central tree. Garden tools of every variety were hung neatly on nails driven into the tree trunk. A fire pit was in the ground nearby complete with a pair of lawn chairs. We came into the clearing cautiously and with our guard up, but there was no need. No one else was around. We explored with great interest. The camp was well stocked with all kinds of things to make mischief with. At one point, my friend found a small hatchet embedded in the top of a tree stump. He dislodged the tool and took a couple of whacks at the stump. Thock! Thock! We realized right away this was the sound we had heard the day before! Mystery solved. But now we had a new mystery—who had created this camp in the woods? Though we would spend most every day for the next two years in and around that very spot, we never would run into the camp builders. 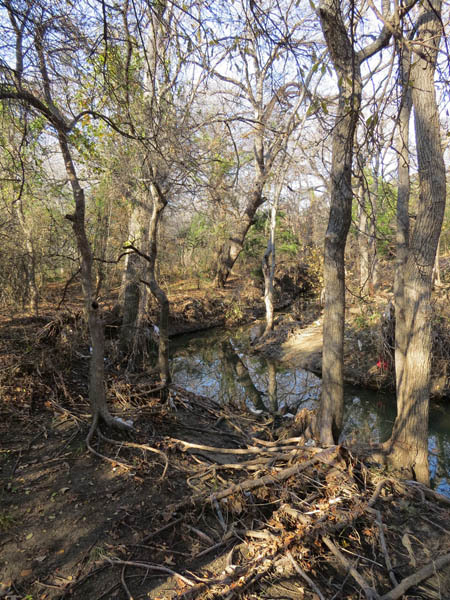 Today, the creek has been rerouted and straightened, but portions of the old channel remain. Our extended drought have left them dry and barren. It is likely that this old stream bed still holds water in wetter times, but today it makes a nice clear path for exploring this part of the woods. 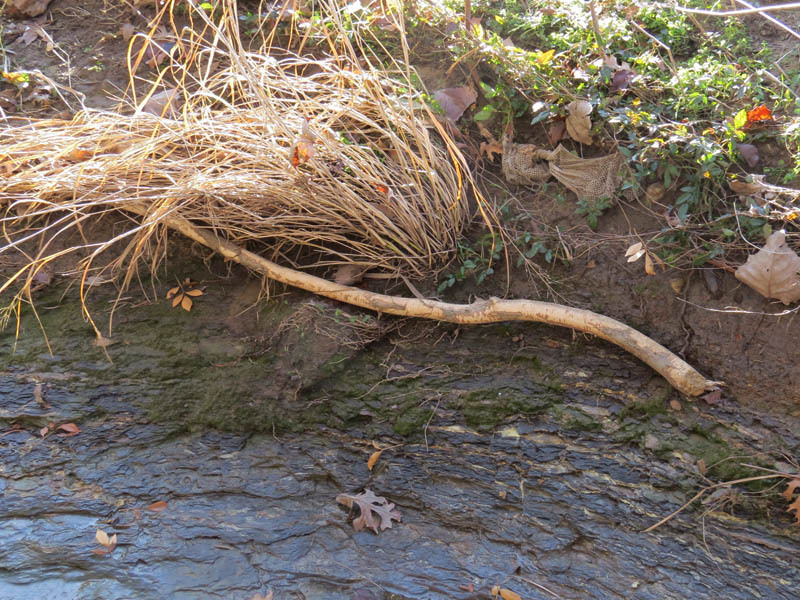 As I followed the meanders of this old creek bed it felt familiar to me. The old course is still the way I remembered it. Dry and silted up, the old channel still seems familiar. 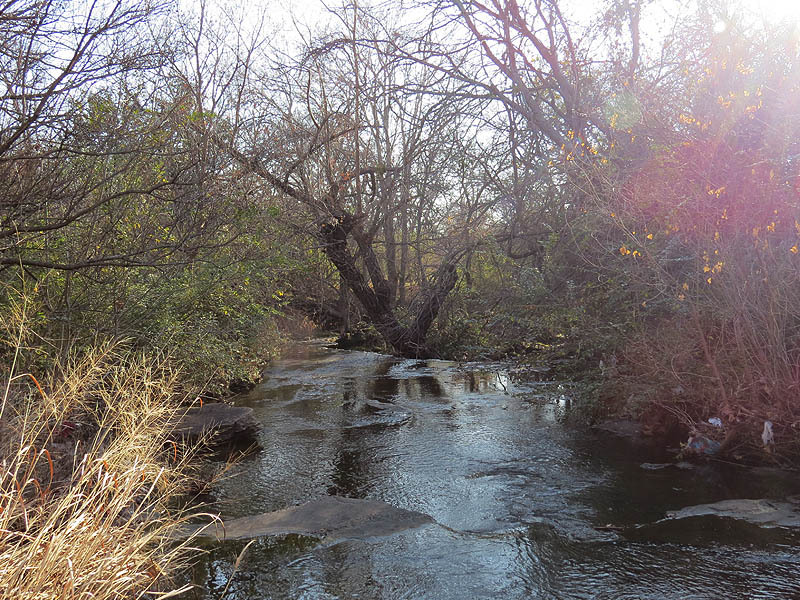 Prairie Creek now runs through a much straighter channel. 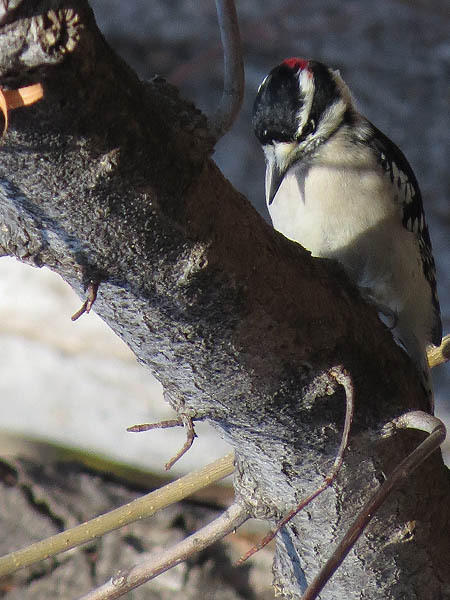 I did not see a lot of wildlife on this December morning, but I did see some. When I think back to the old days in these woods I am sometimes amazed by the amount of wildlife I did not observe. 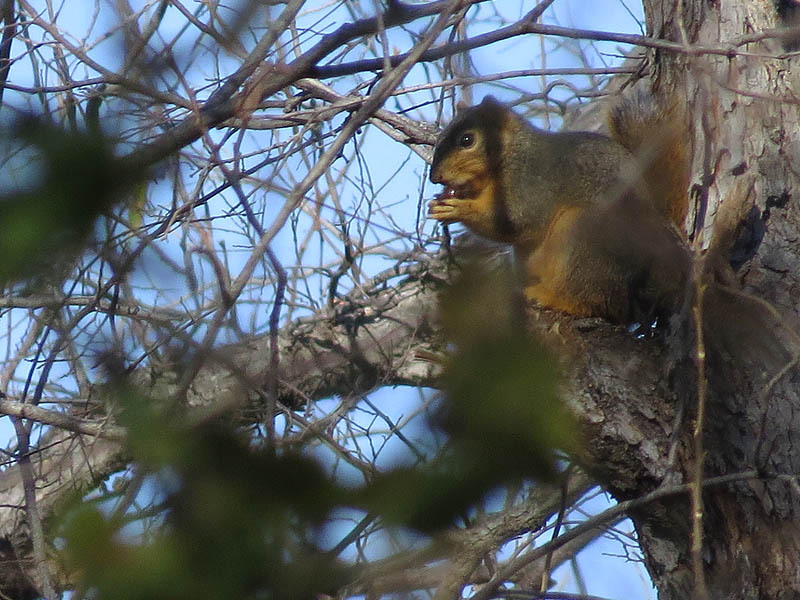 I never once saw a Fox Squirrel, even though the woods were certainly full of them. 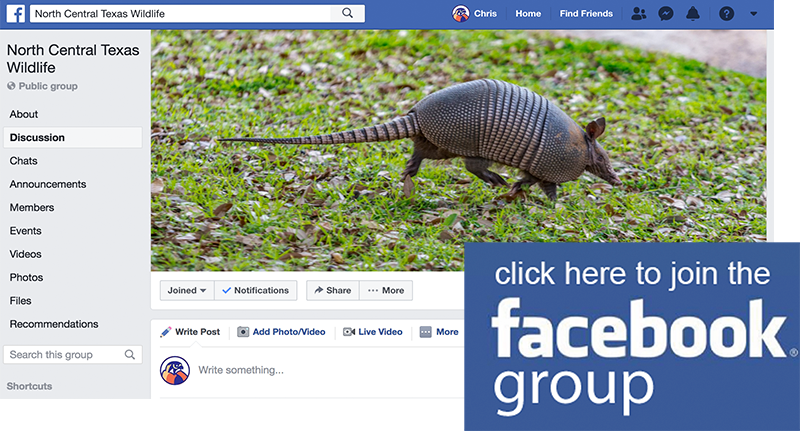 I never saw an Armadillo. There was a lot I missed as a youth because of my own prejudices. I remember finding many canine tracks in certain places. I always assumed dog, because I never believed a Coyote was a possibility. Surely a wild animal like a Coyote would not be this close to a populated area. Looking back now I know most if not all of those tracks belonged to Coyotes, but if I ever crossed paths with a prairie wolf (and I certainly did), I was never aware of it. 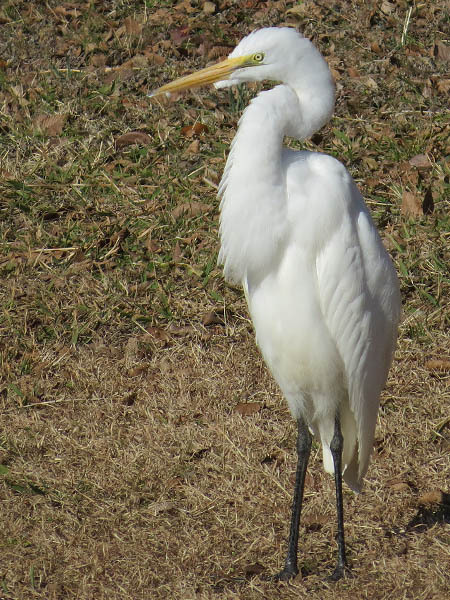 There were also a number of animals that I saw back then with some regularity, that I do not see commonly any longer. I used to catch Speckled Kingsnakes and let them constrict about my wrist. I have not seen one of those snakes in the time since. 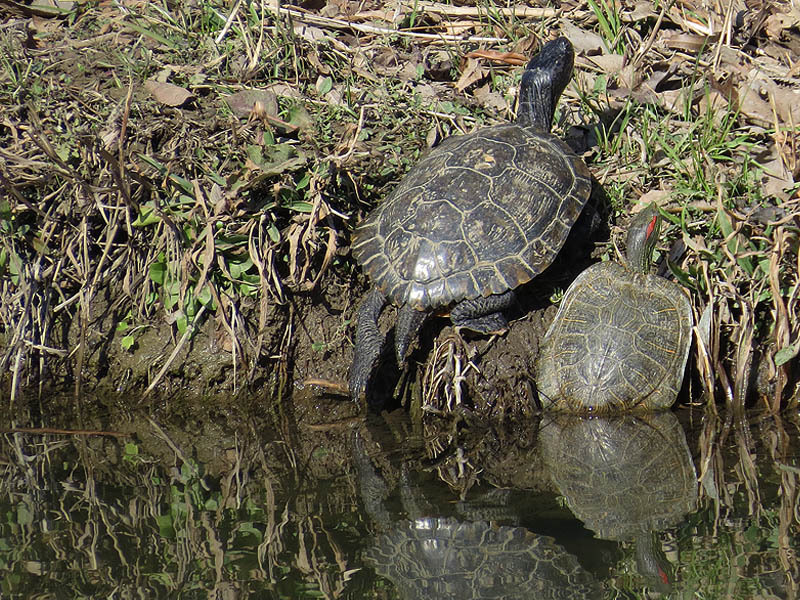 Box Turtles—both Three-toed and Ornate—were common fixtures in the woods around the creek. 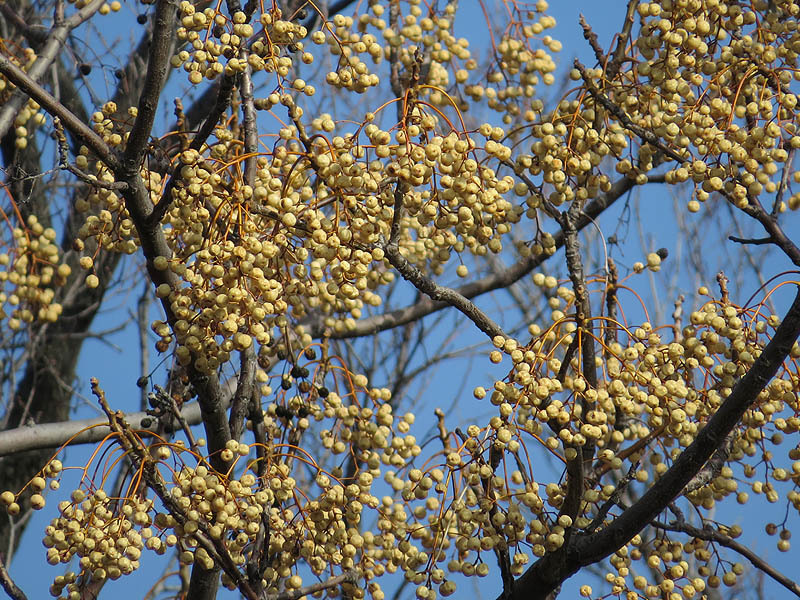 At certain times of the year I would find one almost every time I visited. Northern Bobwhites could always be heard whistling to one another. More than once did I have to steer clear of a hunter working his dog down by the margins. There were places close by where you could see Thirteen-lined Ground Squirrels anytime you wanted. And if you went far enough into the surrounding fields you were likely to flush a Black-tailed Jackrabbit. It has been decades since I have seen either in the wild. 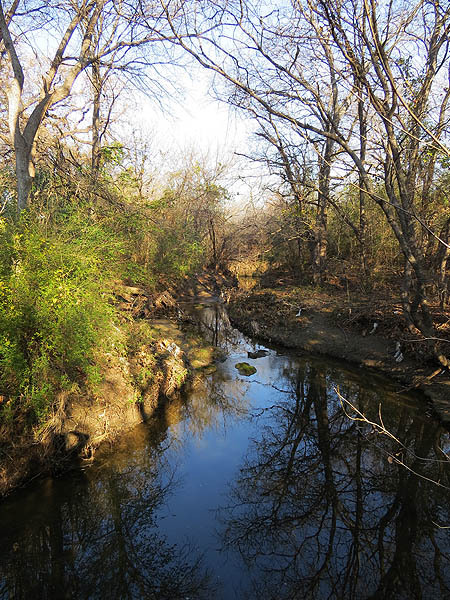 This is also where I first discovered the Texas Rat Snake. It was shocking to find a snake longer than I was tall. I had no idea something like that lived in those woods until I encountered one face to face for the first time. A closer look at the Beaver’s handiwork. 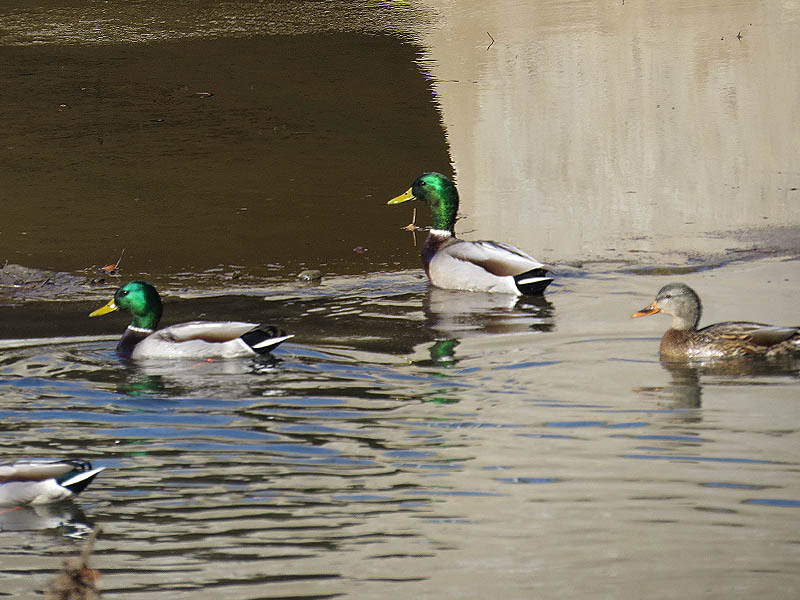 One day as I walked along the dirt road leading to and away from “The Bridge” I heard an unusual squawking noise. I looked to the sky just in time to see what looked like a blue and yellow Macaw fly by. Nobody I told ever believed that story, but an escape pet puts an explanation within the realm of the possible. 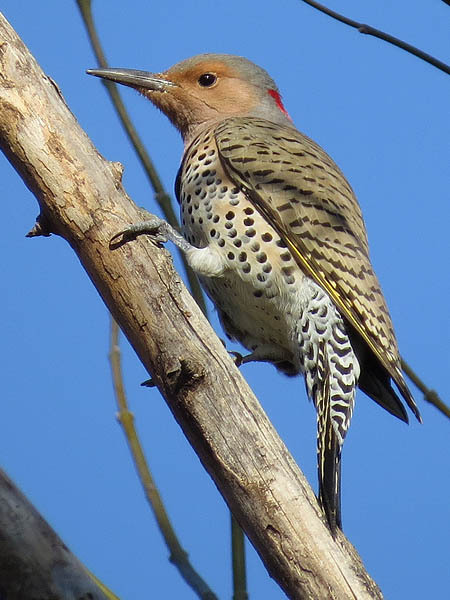 Another time I chased a large Galliforme—a chicken-like bird—around and around a Cedar Elm grove. 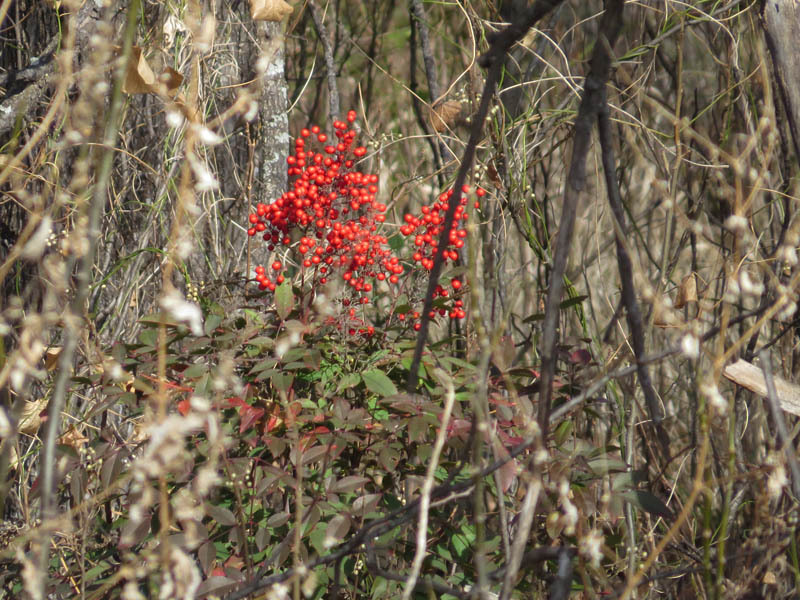 I knew this was something unusual, but the dense vegetation prevented me from getting a clear look at it. 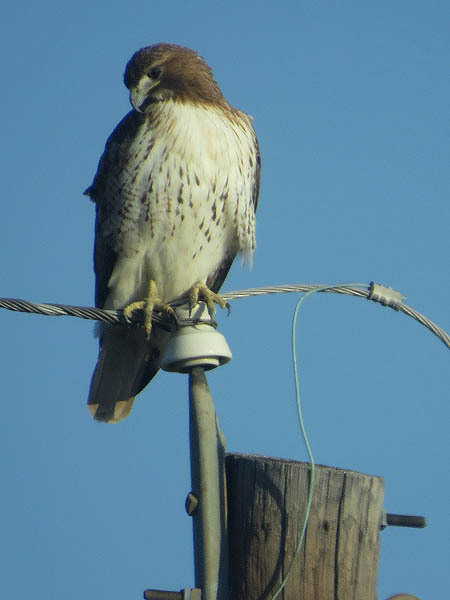 Was it a Wild Turkey, an escaped domestic, or some other kind of gamebird? I have never been sure. 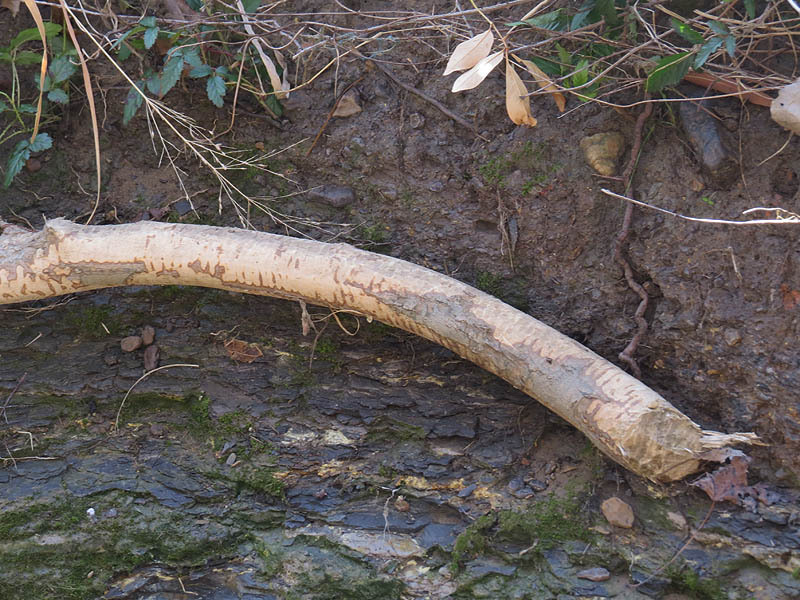 And then there was the cloven hoof print I found one fall in the dried creek bed under a persimmon tree. I found only one impression. No other tracks leading in or away. The aerial photograph shows that there was not much room for deer on this property. Nor did I every see a deer or find any other kind evidence that they were present. The track I found was small—easily under 2 inches in length. If the track belonged to a deer it would have had to have been just a fawn. Maybe it belonged to an escape goat or hog. 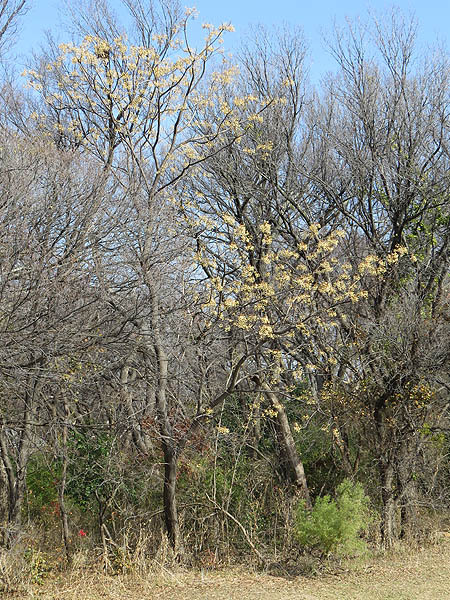 The impression was sharp and clear and lasted all winter long until the first rains of spring. I saw it almost every day over this period of time and have wondered about it ever since. In these stories you will find one of the catalysts for this web site. I have had animal encounters that some people didn’t believe. Other folks had their own stories that sounded like a stretch to me. 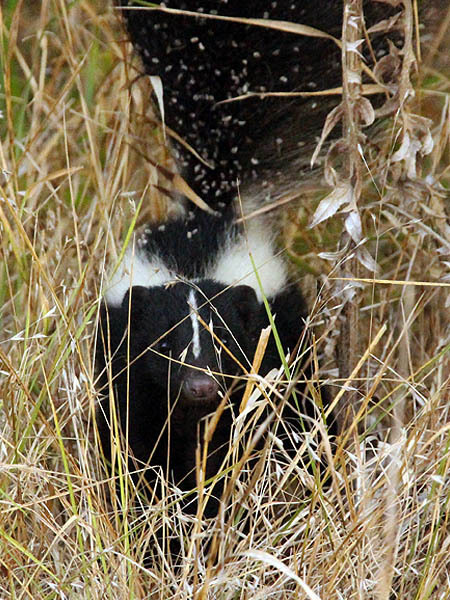 I like the idea of documenting wildlife observations photographically so that claims can be substantiated. On the move again, I crossed Old Orchard Lane and made my way through an area that included a playground and basketball court. 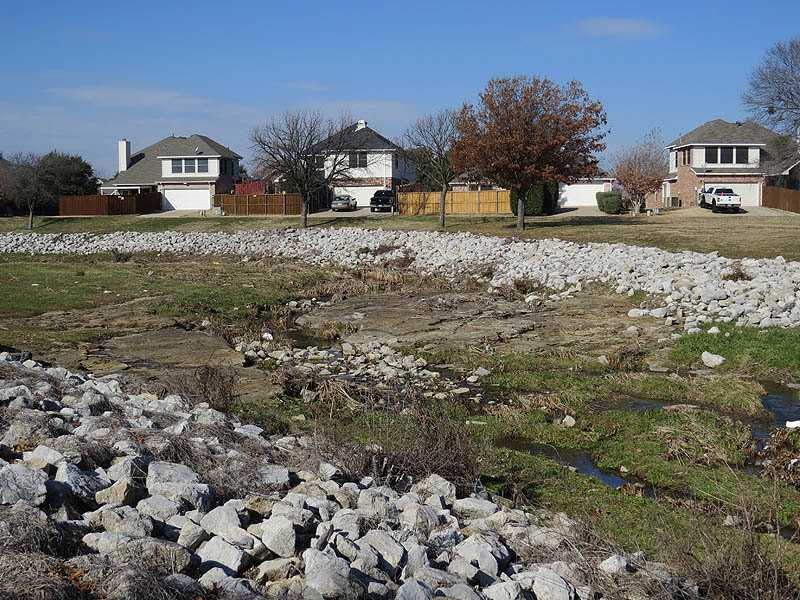 This portion of the park also includes a section of heavily reworked Prairie Creek channel. Natural sandstone along the banks of Prairie Creek. Continuing on this path took me through the section of the park that used to have the dirt bike trails. No hint of them remains. I continued on to Valley Parkway, which was about as far west as I ever wandered in this direction as a kid. Coincidentally, it is also the place where I got my first introductions to Prairie Creek. 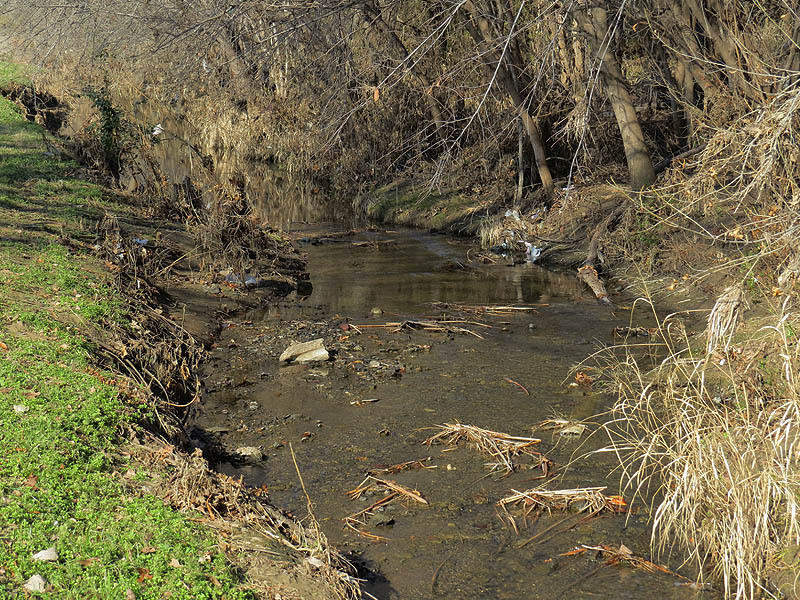 I began my association with the creek by crawdad fishing just next to our subdivision. I’d roll up a piece of bacon, tie it to the end of a branch with a long piece of string, and spent many hours pulling big ‘ol crawdads out of the muddy water. A thoroughly enjoyable pursuit. That was the beginning of many years of big fun along this waterway. My old crawdad fishing hole. It’s not quite the same anymore. But nothing last forever. One afternoon as we headed down to The Bridge we came face-to-face with a big bold white and black no trespassing sign that had been erected at our favorite trailhead. Similar signs had been posted at all of the entrances. 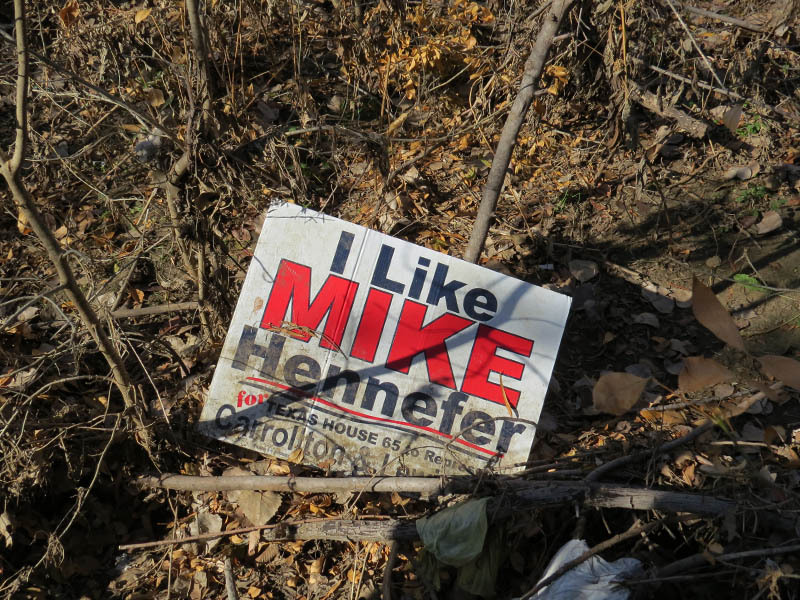 Evidently some governmental department had required the landowner to cleanup that unregulated landfill on the property, and they didn’t want to have to invest the time and expense to do it again—thus the no trespassing signs. We were crestfallen. What we were going to do now? In desperation we began a quest for information. I don’t know how we did it in the age before the internet, but somehow a couple preteen kids were able to locate the phone number of the company that managed the property, and we gave them a call. Some nice man with the patience of a saint spent far longer on the phone with us than he ever should have been expected to. He listened to our pleading, and explained the problems that his company had been forced to deal with. He gently let us know, that no, not even a note from our parents would make it permissible for us to be on the land (at school a note from our parents could fix most any problem!). I got the sense back then that this guy got where we were coming from—that he understood what we were losing and had empathy for us. I still feel that way today. Before we hung up he did offer that he believed that some day the land along the creek would likely be made into a community park, and on that note he was correct. And so ended an era. 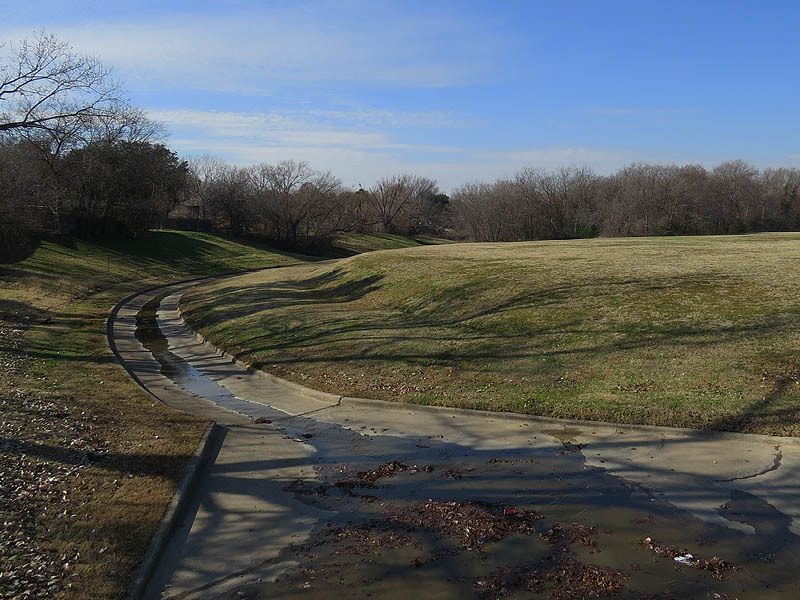 Vista Ridge Greenbelt Park is not quite the same as the Prairie Creek from my youth, but it’s still pretty good. I’m glad there is still a semblance of the past there that I can come back and visit from time to time. Previous Previous post: Bald Eagle – Nest: Week Six Evidence? Chris, a nice essay on your childhood playground, and what has become of it. It brought back memories of my own escapades years ago (and years before you were out on Prairie Creek). The Coombes Creek Road bridge over Five Mile Creek (at the first location where we went with Ben and M.C. last summer) was exactly as you described for Prairie Creek back in the day, as was the Cockrell Hill Road bridge a bit upstream. Both Coombes Creek and Cockrell Hill Road were white rock surfaced, back then (crushed limestone). Part of the area where I roamed has also become a park, as you saw. I suspect the track you mentioned could have been a deer track. 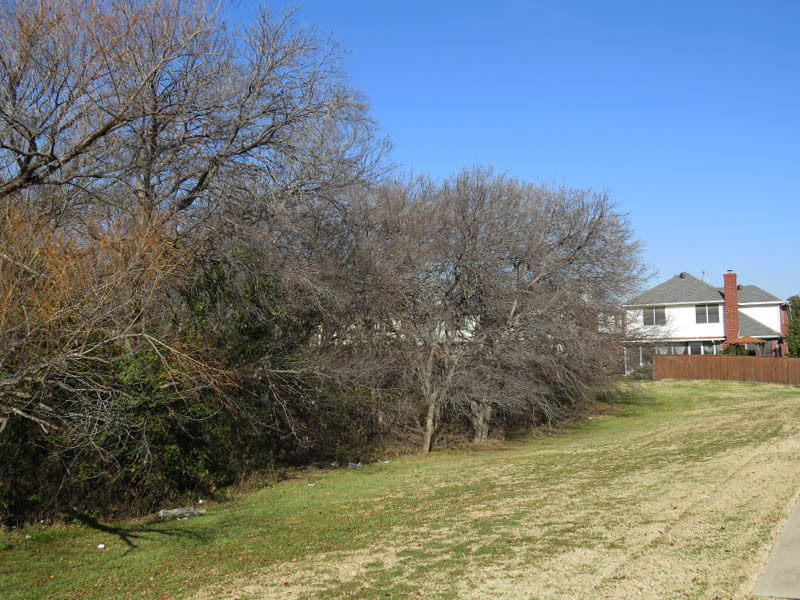 Deer had become more common in Dallas and especially Denton County by then than they were when I was a kid, and deer certainly do perfectly well in suburban areas with some open terrain. Deer are a possibility I suppose. I wish I could go back and have another look, knowing what I know now! 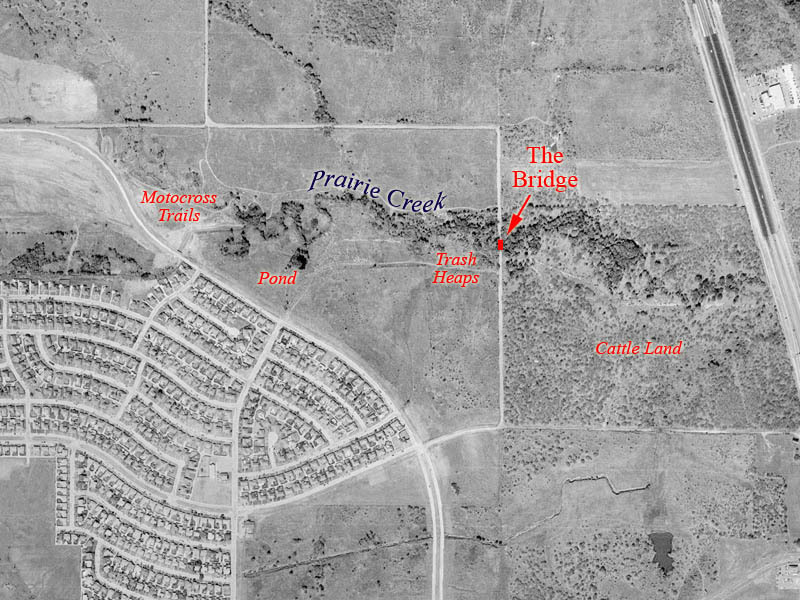 That area east of The Bridge labeled as “Cattle Land” would have been a pretty good place for a small herd. I have a vague memory of flushing two tan animals that fled behind heavy brush. I only got a fleeting glimpse of them, and I cannot recall enough about the sighting to remember why I was not convince that they were deer at the time. Maybe I thought they were too small. I spent most of my time along Prairie Creek between the hours of 4 and 6pm, which is probably not prime White-tailed Deer observing time. Combine that with my inexperience and the fact that I did not believe deer were even a possibility, and it becomes very likely that I missed some important evidence! I’ve discovered just recently, that while there may or may not have been deer on this property when I was a boy, there are definitely deer here NOW. 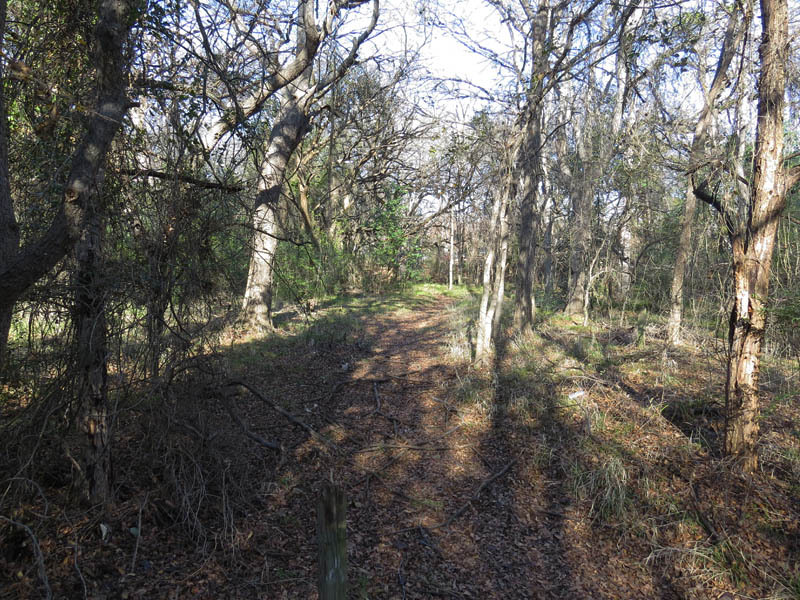 Very surprising find, considering how confined the environment provided by these woods is today because of the surrounding development. Yes, the fact that it could be makes it all that more intriguing now. I really wish i had carried a camera with me back then. As a twelve year old kid I always imagined it would just be the same forever.